Why Does Congress Flail? Voters reward positions more than success. This week, Congress may greet the new (fiscal) year, which began on October 1, with a period of reflection and atonement. As of today, the House has passed six out of twelve appropriations bills, the Senate just one. This week, with days to spare, Congress granted itself a seven-week extension after narrowly avoiding a complete shutdown over FEMA funding. Since Congressional poll ratings were already extremely low, this narrow escape from a government shutdown has renewed criticism of Congressional dysfunction, e.g. Tom Friedman, Peter Orszag, and Ezra Klein. The source of most public frustration is that Congress struggles to compromise on solutions to major problems or even routine “maintenance” legislation. Both scholars and media reports blame this on ideological polarization: Republicans and Democrats just have starkly different views of how this country should be governed. But this does not explain why a) the parties also cannot agree on proposals that they essentially agree on, e.g. tax cuts for small business, or setting up a budget commission (circa January 2010). Nor does it explain why, despite their differences, they do not quickly arrive at the inevitable compromises immediately rather than the slow, nerve-rattling, edge-of-the-abyss negotiations we observe. The most recent edition of the Journal of Politics includes an article by Philip Jones that, in my view, does a lot to explain Congressional dysfunction. ”Which Buck Stops Here?” (ungated) tests whether voters’ decisions in the 2006 Senate elections were based on incumbent senators’ policy positions, or the state of the national economy and the occupation of Iraq. Even controlling for party affiliation and ideological similarity, Jones finds that voters weighed policy positions in their vote choices, while “peace and prosperity” outcomes had little impact on voters’ support for incumbent senators. 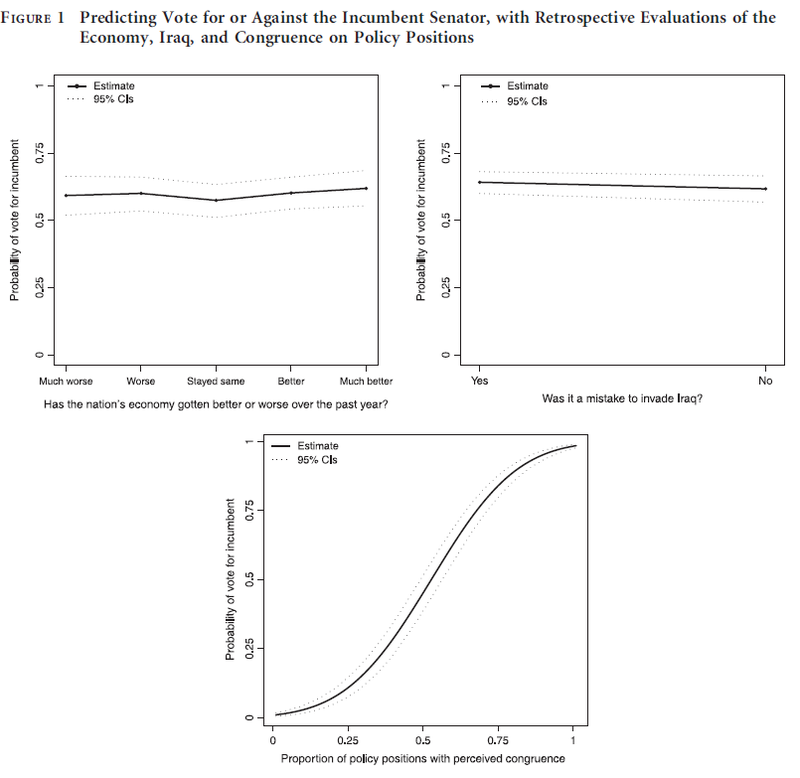 Figure 1 displays these findings: the nearly flat lines for the first two charts show the minimal effect of policy outcomes on vote choice, while the steep upward slope of the bottom figure illustrates how the more voters agree with senators on policy positions, the more likely they were to vote for the incumbent. ﻿The article goes on to compare the effects for Republican and Democratic Senators, and to demonstrate that election analyses that that only test for the effects of policy outcomes without considering candidates’ policy positions are likely to reach the wrong conclusions. As Jones points out, these results are a “relief” to members of Congress, who have little personal control over collective policy outcomes but do control their portfolio of issue positions. On the other hand, these results also help explain why it is so hard for members of Congress to compromise (say, on FY2012 appropriations bills): deviating from their policy positions to achieve a compromise may have significant electoral costs with little political gain for actually getting something done. How do college graduates and others vote? 7 Responses to Why Does Congress Flail? Voters reward positions more than success. In a nutshell, voters are responsible for political dysfunction because they expect elected officials to maintain ideological values while failing to grade them on their ability to “get things done.” And politicians love this because all they have to do is be intransigent. Or lie about their true beliefs. Which just about sums up Congress and the President. The scholarly article linked here points out that this is true regardless of the educational level of voters. If we discount ignorance, we are left with apathy as the reason. We simply do not have high expectations of politicians, and they never disappoint us. The reality here is that Americans have given up on their own political system, one which has been hijacked by corporate lobbyists and foreign special interests. We’ll never get it back until we have a good old-fashioned revolution. Any libertarian reading this is likely to feel somewhat vindicated. It would appear to be rational to minimize how much social decision making is delegated to such incentive structures. American voters may have a good reason to reward positions more than success. Contrary to what one sometimes hears, the US Congress has been remarkably effective in the last ten years; they’ve authorized and funded several wars, created the Department of Homeland Security, passed several major tax cuts, given their blessing to an unlimited wiretapping program, given a trillion dollars to Wall Street, added prescription drug coverage to Medicare, enacted the “Obamacare” health insurance law, established unlimited detention of terrorism suspects at Guantanamo Bay, greatly expanded the role of the federal government in education, etc etc etc. It would be difficult to find another decade in American history when Congress has produced so much major legislation. So, if we define legislative success as “getting things done,” recent Congresses have been among the most successful of all time. Yet few if any of these “things” are beloved by the general public; while some of them might have majority support, it would be hard to assemble a crowd that would cheer for any of them. A politician seeking reelection might be able to defend support for these legislative achievements, but would be very unlikely to find a public whose enthusiasm for any of them would translate into votes. How does this fit together with the strong link between Presidential voting and economic performance, though? It’s odd. Voters don’t expect Senators to actually do things. Voting for Senator is ultimately a value-expressive act, rather tha one designed to lead to the passage of any actual bills and, hence, influence outcomes. On the other hand, people seem to think that Presidents have a great deal of power, even when this isn’t the case. Could partisan motivated reasoning also play a role? Why is there such a link between collateral consequences of war, namely casualties, and election outcomes in Congress? When the policy effects of the war are negative, voters punish incumbent members of Congress. If policy effects are measured with surveys, perhaps these results hold, but if policy effects are measured exogenously to voter choice, what explains this paradox? Very interesting paper, at least what I have read so far. By “these results hold,” I meant the author’s results.